When I was a young boy in Hong Kong, I saw a movie set in Mexico during the revolution of 1910. One scene that left a deep impression in me was Mexican revolutionaries riding in front of an imposing pyramid. For 60 years, I wanted to visit that pyramid. I finally crossed that item from my bucket list earlier this year. 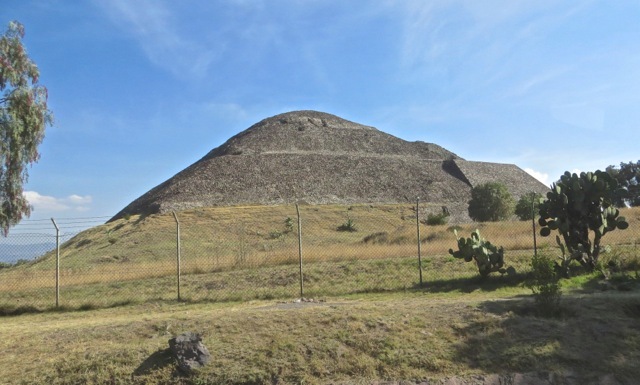 Teotihuacan is located on the edge of today’s Mexico City. Two thousand years ago, it flourished and was one of the largest cities of the world at that time. Its culture declined and became lost to memory. For almost two thousand years, its monumental pyramids stood as memorials to this extinct culture. 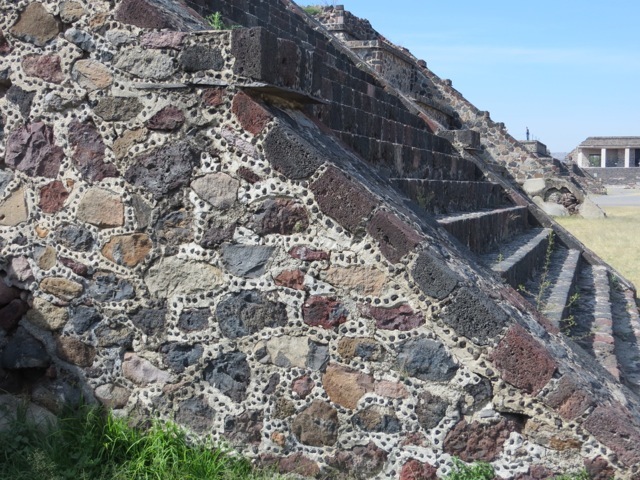 When the Aztecs saw these abandoned pyramids hundreds of years later, they called them the Pyramid of the Sun and the Pyramid of the Moon. The true purpose of these pyramids are unknown. 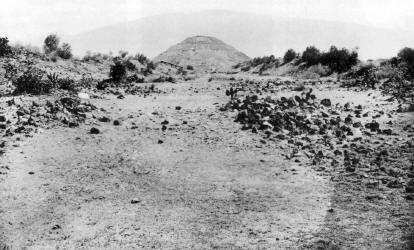 In 1905, the Pyramid of the Moon lay at the end of the debris-strewn Avenue of the Dead. 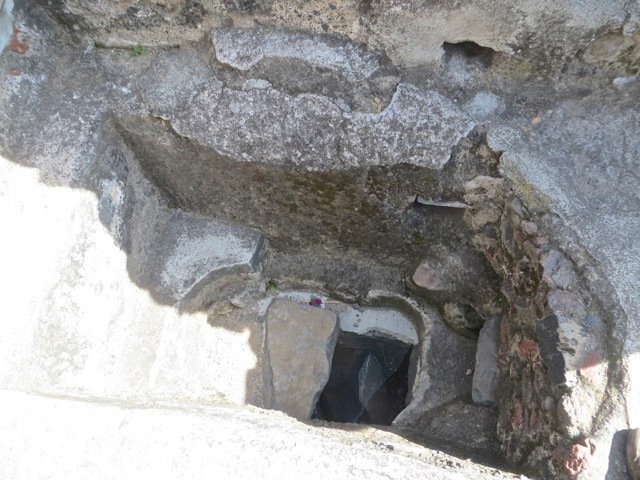 In the last 100 years, archeologist have researched this site and restored many parts of it. 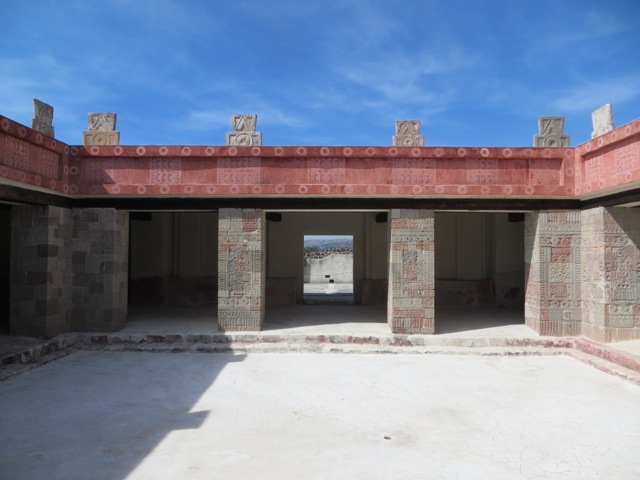 Temples and shrines flanking the Avenue of the Dead have been reconstructed to the best guess of archeologists. An unusual and laudable method of restoration distinguishes new reconstruction from the original relics. 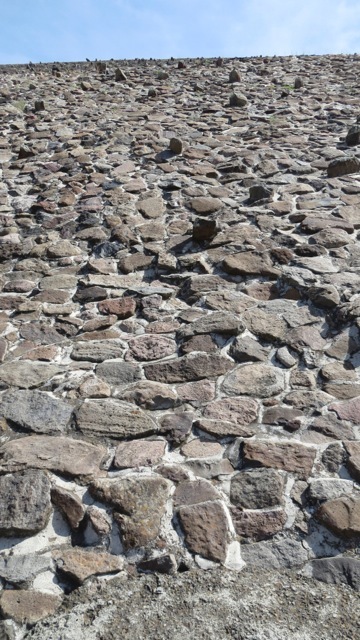 Newly constructed mortar is imbedded with pebbles, giving visitors an visualization of the unrestored site. The lower part of this partial wall is original relic, and the upper part is newly constructed. 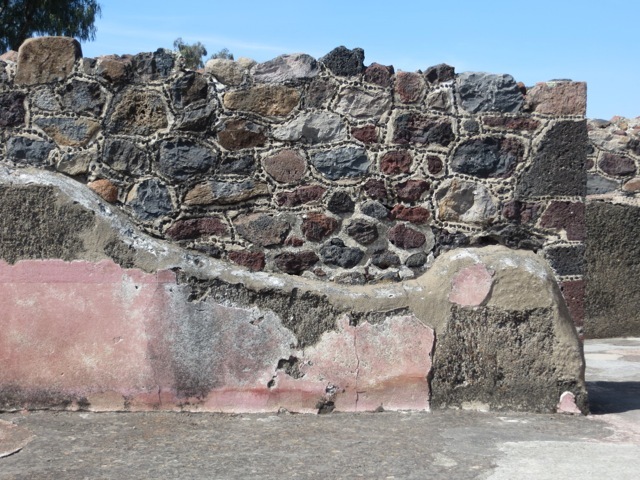 The stone wall is covered by six inches thick stucco, surfaced with smooth plaster, and painted with brilliant colors. 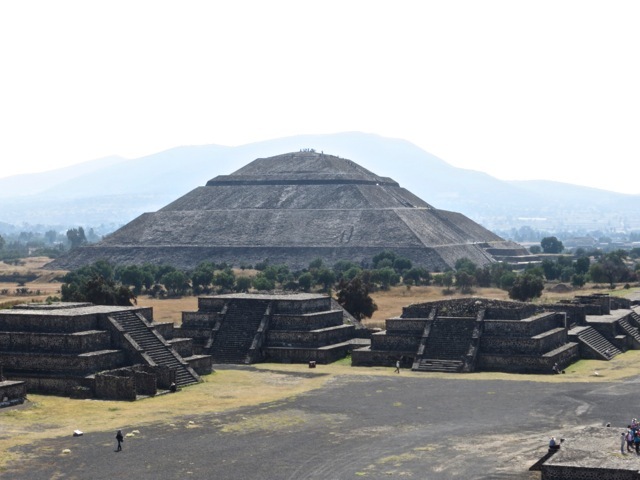 In this large complex of pyramids and temples, there were living quarters for the priests and aristocrats. This house has been restored by archeologists. 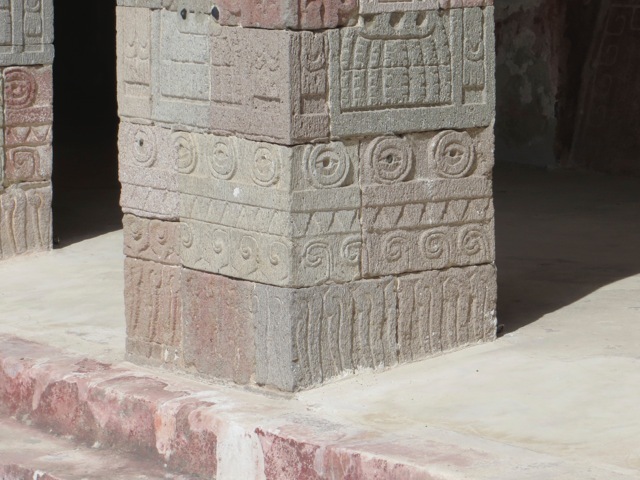 The columns are composed of original relic, red stones, and newly carved grey stones. The interior of this house was painted with fresco. Wet plaster was applied to the wall and colored with paints and pigments which became permanently absorbed into the paster. 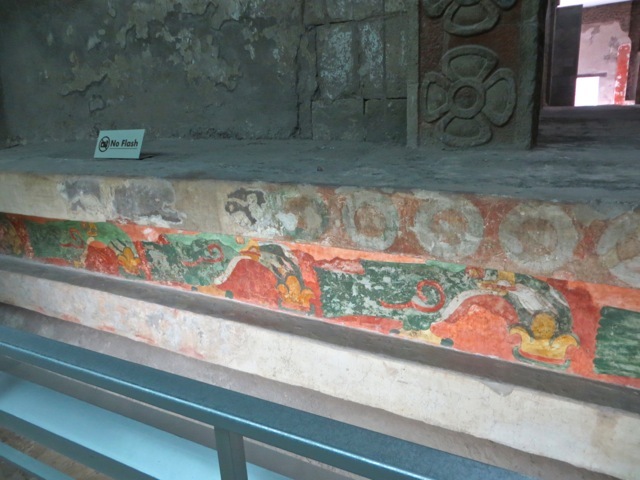 The colors remains highly visible after nearly 2,000 years. 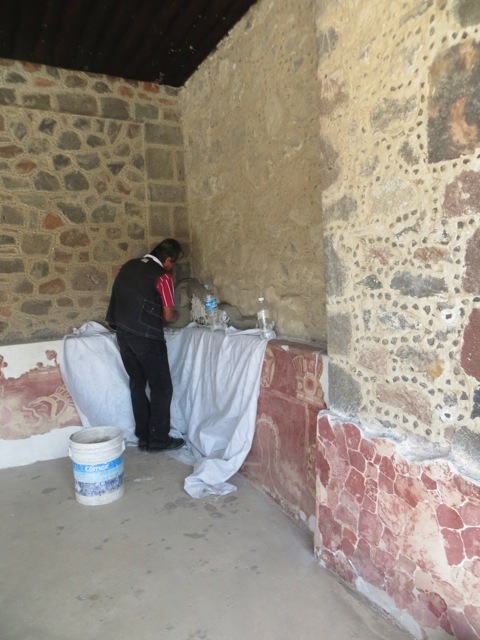 A workman was restoring an interior wall. Part of the wall was original and another part was newly constructed. The fresco on the plaster was protected as the man worked. The aristocrats and priests prepared for religious ceremonies by cleansing themselves in a sauna. 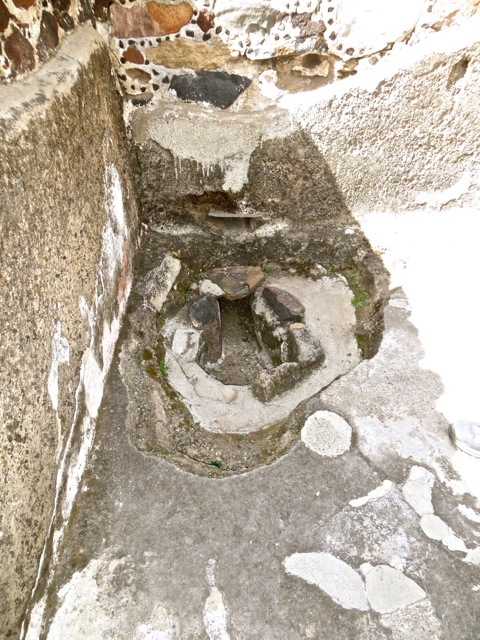 This pit would contain a fire, and water was piped in to create steam. This was an indoor toilet flushed by water fed in by a pipe. 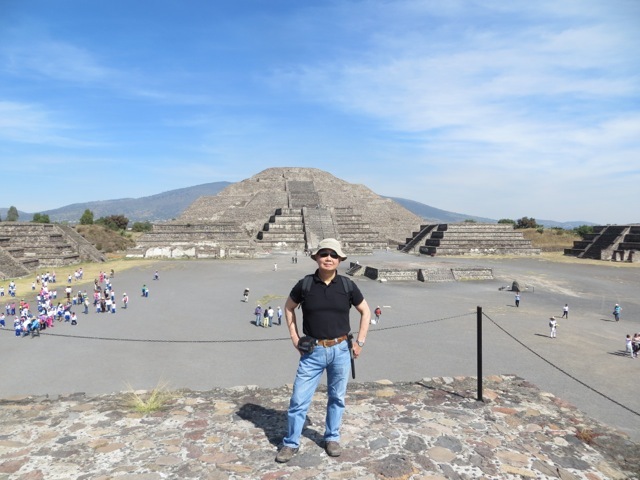 I stood on a shrine with the Pyramid of the Moon in the background. 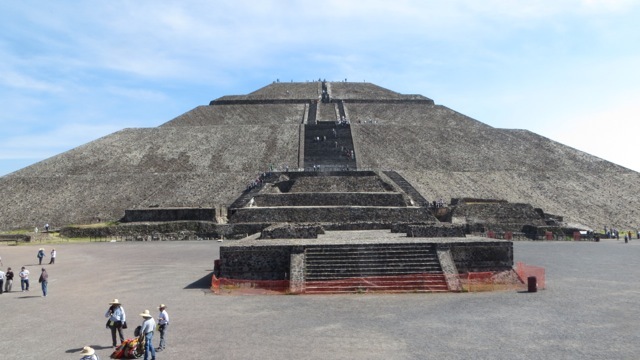 The front of this pyramid has platforms with steep stairs. 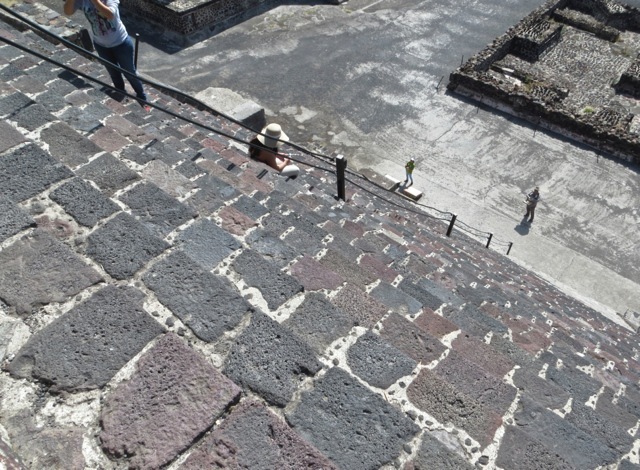 This side view of the Pyramid of the Moon shows the main pyramid above the platforms that are accessible by stairs. The apex of this pyramid is 140 feet tall. The stairs leading up the platform is very steep. The steel cable handrail makes climbing easier and safer. 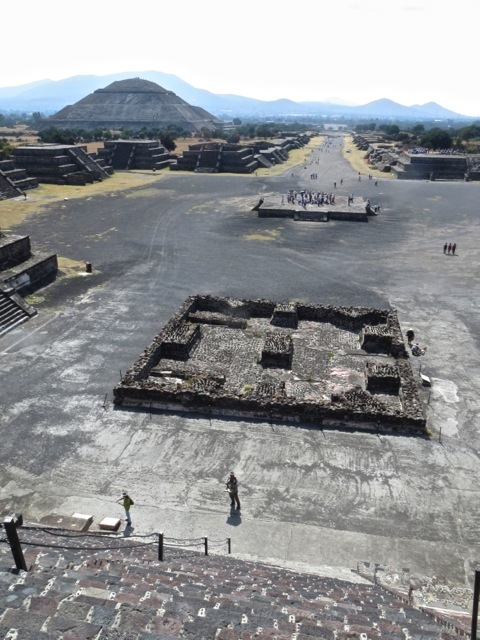 From the Pyramid of the Moon, I looked straight down the Avenue of the Dead with low shrines on its sides. 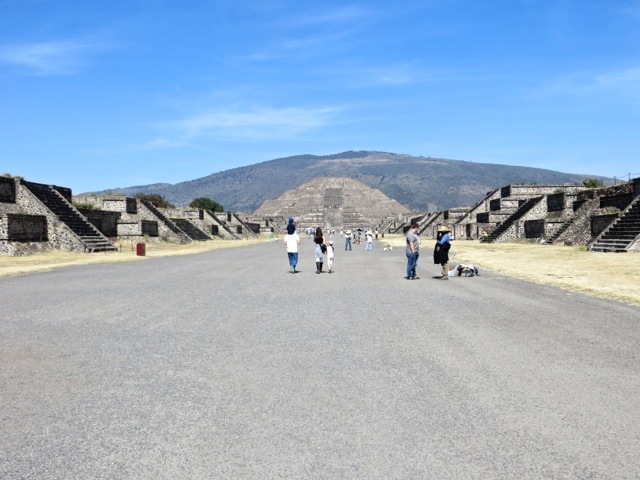 The Pyramid of the Sun lies on one side of the Avenue. The stepped Pyramid of the Sun is 230 feet tall, making it the third tallest pyramid in the world. There used to be a temple on the peak, but it has been destroyed. 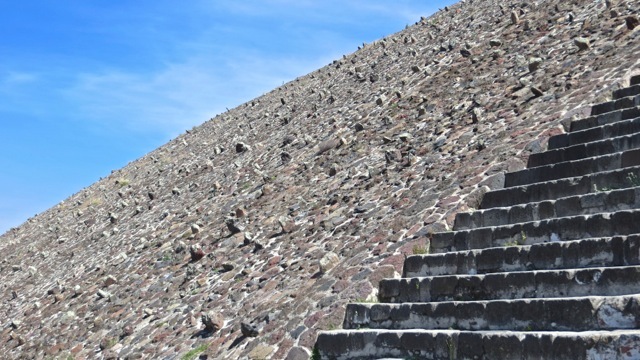 The stairway climbs up sections of the pyramid, providing welcomed rest. It takes 260 steps to climb to the peak. The mortar of this pyramid lacks pebbles, indicating original construction. This masonry work is very well done, surviving thousands of years of weathering. Random stones protrude from the smooth face of the pyramid. They look like trees on a mountainside. 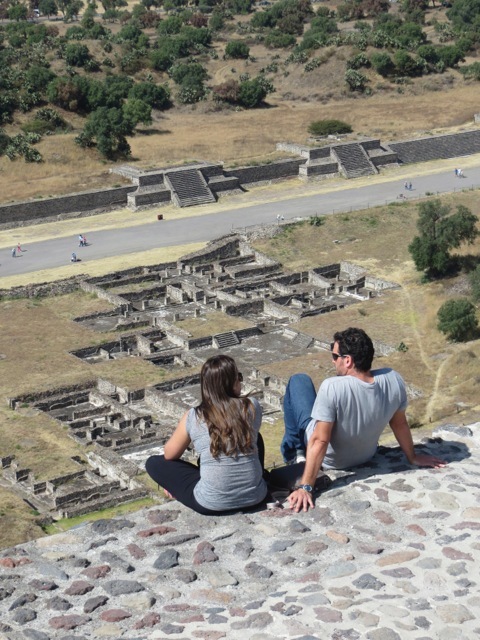 Looking down from the pyramid, an excavated residence complex for the elites is plainly seen. Pyramid of the Moon is seen from the peak of the Pyramid of the Sun. This man was deeply enchanted by this sight, oblivious to the young woman posing for a souvenir photo. Posted by Robert Wu on Saturday, May 10, 2014, at 9:34 pm. Filed under Uncategorized. Follow any responses to this post with its comments RSS feed. You can post a comment or trackback from your blog.